Reliable HVAC Service for over 25 Years! For over 20 years, Action Air of Sarasota has had the privilege of servicing the heating and cooling needs of our customers, throughout South West Florida. Our motto is "Action Speaks Louder Than Words" and it is a phrase we live by and demonstrate daily. At Action Air, we treat our customers like family by providing professional, reliable, and affordable services. Customer satisfaction is our primary focus. Whether it is maintenance, repairs, new HVAC system installations or custom work, the Action Air team will ensure you are 100% satisfied. As a fully licensed (License # CAC056672) and insured HVAC contractor, we never subcontract out work and only use quality equipment and new parts. You will never see hidden or unanticipated fees in our billing. We provide up front pricing and clearly explain repairs and our troubleshooting recommendations. We stand behind our work and products. Let Action Air show you how action speaks louder than words. Call Action Air of Sarasota today to schedule a free inspection. Action Air is of Sarasota is among the top rated Air Conditioning companies in Southwest Florida. Our highly skilled HVAC technicians can help you with all your air conditioning needs. Action Air Conditioning of Sarasota services the Southwest Region of the State and its surrounding communities. We pride ourselves on ensuring that proper maintenance, repairs, and installations of your HVAC unit are performed to the highest level of expectation. We communicate with you so that you have a full understanding of the work performed, any recommendations for the future, and how best to get the longest lifespan from your HVAC unit. If you want to decrease the chances of untimely breakdowns for your HVAC during the hottest days of the year, make sure you get regular air conditioning maintenance. A complete system check every 6 months can significantly improve the performance and lifespan of your air conditioner for years to come. No job too big, no job too small. We value our customer's trust and work very hard to keep it. We are prepared to go to the distance to ensure the highest level of quality and service. We stand by our slogan, "Action Speaks Louder Than Words", let us show you the difference that is Action Air of Sarasota. The most important day of your air conditioners life is the day that it is installed—nothing will affect its energy efficiency and longevity more. When you need air conditioning installation services in Southwest Florida, make sure you trust your home's comfort with the best by contacting Action Air! Our trained staff has installed tens of thousands of HVAC systems over the last 25 years. 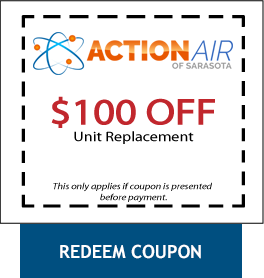 At Action Air of Sarasota, we have over forty years of experience repairing, replacing, installing, and maintaining home heating systems such as furnaces, heat pumps, dual fuel systems, and all types of forced air heating systems. No matter what your heating service needs are in Southwest Florida our knowledgeable technicians have you covered. Although heat isn't considered the highest area of concern with your HVAC system, especially in Florida, we know how frustrating it can be when it doesn't work. At Action Air of Sarasota, we check the heating when we perform our maintenances and servicing. The best way to make sure your heater will reliably heat your home in the winter months is to have regular maintenance performed. This will ensure all important components of your heating system are in good working order and reduce the need for repairs. A complete system check every 6 months can significantly improve the performance and lifespan of your heating and cooling system for years to come. Duct Cleaning is the cleaning of the various heating and cooling system components of forced air systems. This includes the supply and return air ducts and registers, grills and diffusers, heat exchangers heating and cooling coils, condensate drain pans (drip pans), fan motor / fan housing, and the air handler unit housing. 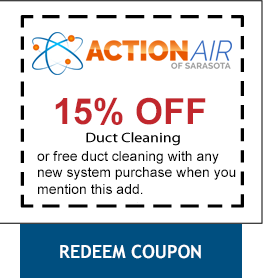 Action Air of Sarasota uses an antibacterial spray that sanitizes and seals the ducts also known as "fogging". Fogging can be administered with or without cleaning the ducts. Duct cleaning and Fogging has a number of different uses including odor control, sanitizing, and pest control. Cleaning the interior of your HVAC and the air systems is important, aside from killing and ridding your systems of all mold, debris, and bacteria, it prevents them from growing again. "In an age where customer service appears to not exist for cable providers, communication providers and many "service" companies, Action Air stands apart from the norm. We presently have nine rental locations in Sarasota that we must maintain in a good operation plus our residence and reliable professional services are critical to our operations. In every phase of our mechanical needs from Action Air we are never disappointed. When we leave a message for service, we receive a prompt response, appointments are handled timely and efficiently with appropriate billing for the services provided. In many situations where we felt a new A/C unit was probably required, a minor repair was completed and our systems continued to operate for a number of years. This company is truly "Old School" and trustworthy."